Bikers have suspended Westminster’s parking tax! Back in June 2009, we published a post called “Blanche Neige in Westminster“, where we exposed how the motorcycle parking signs had been defaced by angry bikers, who were disgusted and fed up with a Tory Council, the wealthiest in London, the UK and indeed the whole of Europe, that had decided to impose a stealth tax on motorcycle parking. 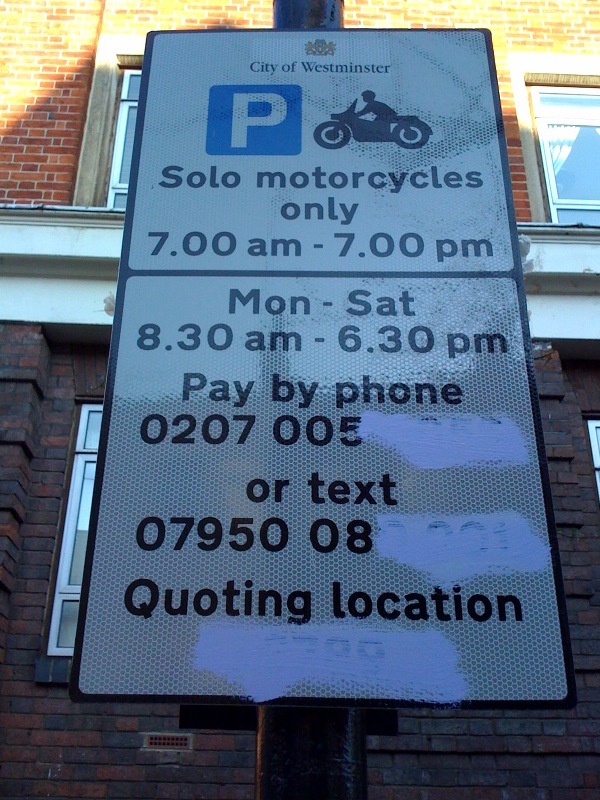 We were amazed to find out that it had cost Westminster Council circa £200,000 to replace or clean up defaced motorcycle parking signs at the time, and that the Council was so keen to spend that much of tax payers’ money to get their highly unpopular motorcycle parking tax back in. Well, while Conservative Councillor Danny Chalkley is still trying hard to impose his poison on bikers, residing in and commuting to Westminster, and spread it all over London and the United Kingdom, some bikers, fed up with being stealth taxed without justification by a Council that quietly introduced a parking tax on illegal grounds 17 months ago, have decided, as a new year’s resolution, to re-introduce free motorcycle parking by defacing all the motorcycle parking signs again, thus making Chalkley’s bike parking tax unenforceable. What a wonderful feeling it is to find the motorcycle parking signs around our office and home all defaced and have the pleasure to park for free anywhere we like! We drove all around Westminster today and didn’t find a single bay that had not got defaced signs. This should no doubt cost Westminster Council a hell of a lot more than £200,000 to replace and clean up all these signs, so they might be better off removing the signs and scrapping the tax once for good, as nothing suggests that those angry bikers will not come back and cause damage again! We saw signs defaced in all sorts of colours, including white, blue, pink, red, green and black. Wow, what a lovely scenary, we just thought for a minute that, despite the freezing temperature, the summer was already back, with all these beautiful colours everywhere! We even saw signs taken off their pole! Not only were we delighted to imagine Chalkley and Gilchrist pissed off and their first working week of the year ruined as a result, as if they didn’t have enough on their plate with the EU Commission’s, Office of Fair Trading’s and DCLG’s investigations into the illegal parking related activities they are suspected to have carried out, but also to see how the British culture, at least among bikers, is slowly evolving towards protesting hard and standing up for their rights, needs and wants. Councillors are not above the public, they are elected and paid to serve the public, they are nothing other than public servants. There’s no fundamental difference between a waiter and a councillor: both are paid to serve their customers in the way they want to be served, and that’s it. So when bikers say NO, NO and NO to the bike parking tax and ENOUGH is ENOUGH, they bloody mean it, and they’ve proved it today by defacing all the bike parking signs and showing those Tory Councillors how they wish to be served by them. Well done, guys! You’ll get better at protesting than the French at this rate! 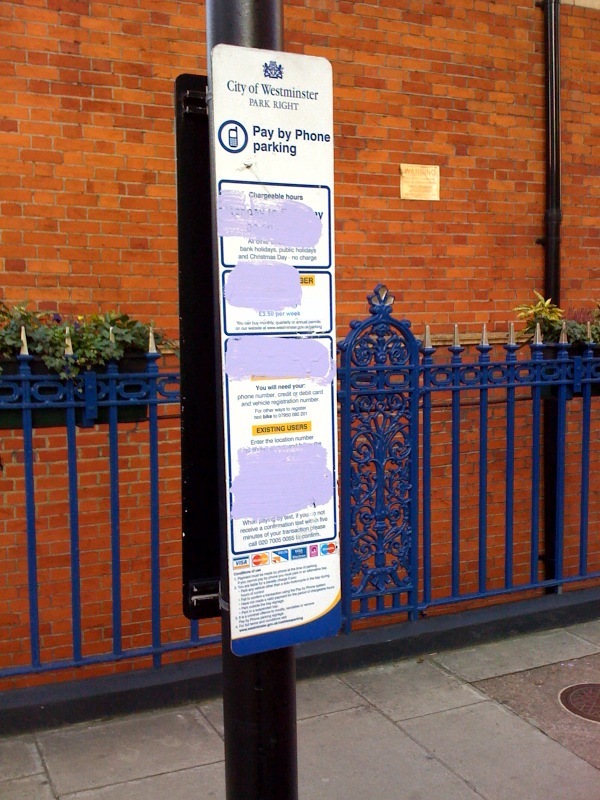 Don’t forget that if signs are defaced, the parking bay is free of charge, and you can find more about what to do by clicking here should a cheeky warden issues your bike with a PCN. If you have a story you would like to see published on UK France Bikers.com, please contact us here. Si vous avez une experience a partager et que vous souhaiteriez voir publiee sur UK France Bikers.com, n’hesitez pas a nous contacter en cliquant ici. I bet Westmonster and Verrusca didn’t plan on a mass rebellion like that ? Well done to whoever is helping bikers get free parking back ! Well done! That’s all what Westminster Council deserve! They haven’t listened, now they bear the consequences! How great, I can park my bike for free again! Thanks ever so much whoever did all this. Fantastic! These bastards will not get away with their bike parking tax. Sounds like the battle is now evolving into radical action. Westminster made a very grave mistake to impose a stealth tax on bikers, they will severely regret their decision and never touch bikers again. I’m not a motorcycle but do support you guys. This tax is a non-sense, you have a mode of transport that alleviates public transport, congestion and reduces pollution. These bureaucrates are just interested in money, they tax whoever they find on their way. It’s good that you’re now making your own way by reversing their ridiculous tax policy. It’s a REAL pleasure to see sprayed signs in Westminster! The guys who do the “spaying” are awesome! You guys Rule! Oui Christophe nous avons appris, finalement, cette leçon de nos voisins, les citoyens de la France. Je pense que les manifestations uniquement ne changeront pas cette mauvais loi. Les activités des “Rathboners” qui empêchent les charges et donc la raison d’etre de cette législation obligeront les conseillers de réfléchir un autre fois. Merci Phil pour tes commentaires. Nous sommes contents de voir un commentaire en francais. Surtout n’hesitez pas a laisser vos commentaires en francais si vous le souhaitez, ce site est cense etre bilingue! Vous êtes très gentil même si je parle et ecris le français comme une vache espagnole !